Recipes From Russia: The Simple Ground Meat Cutlet – Russian Style! Russian word is “kotleta” Lets make some Cutlets! * two to three slices of white bread ground up thoroughly. In a large mixing bowl put the ground meat and well minced onion. Then add the egg and any and all spices that you desire. Then on top of that add the diced and shredded bread. Then add half cup of milk and if desired throw in some crushed fresh garlic. 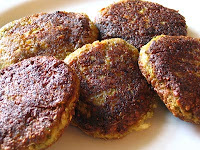 In a large non stick skillet with a good layer of veggy oil place the cutlets non touching to fry in the hot oil. Medium heat is good for non stick. (If using old cast iron skillet then increase heat to help stop sticking problems.) Fry about 7-9 minutes per side if very thick. (Due to use of pork make sure cutlet is well done.) Cover skillet for deep cooking the meat. Served as a main dish with pan-fried potatoes, mashed potatoes, pasta and or rice are some of the many side dishes. I like them dipped in sour cream. Notes: You can use ground chicken or turkey also as the meat.